← Each person is il-legal: Let us open the doors to all! “Yesterday Kobane, today Cizre” could be read among the slogans carried in a solidarity protest with the kurdish cause in Paris last Thursday, September 10. As in other european cities, the protest was called to denounce the the ongoing military siege and intervention in the largely kurdish city of Cizre, in turkey. The “anti-terror” attack began on the 4th of September and pitted the turkish military against PKK activists. Dozens, mostly civilians, have been killed in the clashes, with many wounded dying impeded from seeking medical attention. Besieged, under curfew, with electricity, water and telephones cut, with no one permitted to enter or leave, Cizre (a city of 120,000 people on the border with syria and close to iraq) has become a land without law for the purpose of destroying any kurdish aspirations to political autonomy. In an effort to secure silence around all that is happening, journalists are arrested, foreign journalists expelled and the offices of opposition newspapers destroyed: a fate suffered by Hürriyet on the 9th of September. The military operation against majority kurdish urban centres also extends to the cities of Yusekova, Diyarbakir and Nusaybin. If all of this State driven violence can be understood as part of Erdogan’s and the AKP’s ambitions to dominate turkish political institutions, it is we suggest only part of the story. The supposed turkish military intervention against ISIS, initiated this last summer, was never more than a cover to act against the kurds, whether outside or inside the country. The AKP has in fact supported, in various ways, the expansion of ISIS. What is of real concern to Erdogan’s authoritarian and racist rule, and to that of all of the neighbouring states, is the contagion of the non-sectarian, non-ethnic, decentralised experiment in local democracy that is exemplified by Kobane and also the memory of the experience of open, collective self-management in the movements sparked by the Gezi Park occupation of 2013. It is autonomy that Erdogan and his like fear and they will do whatever they can to destroy it. And yet as they press against it, autonomous resistance emerges in the form of peace marches, demonstrations, organised community self-defense, solidarity and mutual aid. Below is the transcript of our interview with three members of the anarchist group Devrimci Anarsist Faaliyet (DAF, or Revolutionary Anarchist Action) in Istanbul during May 2015. 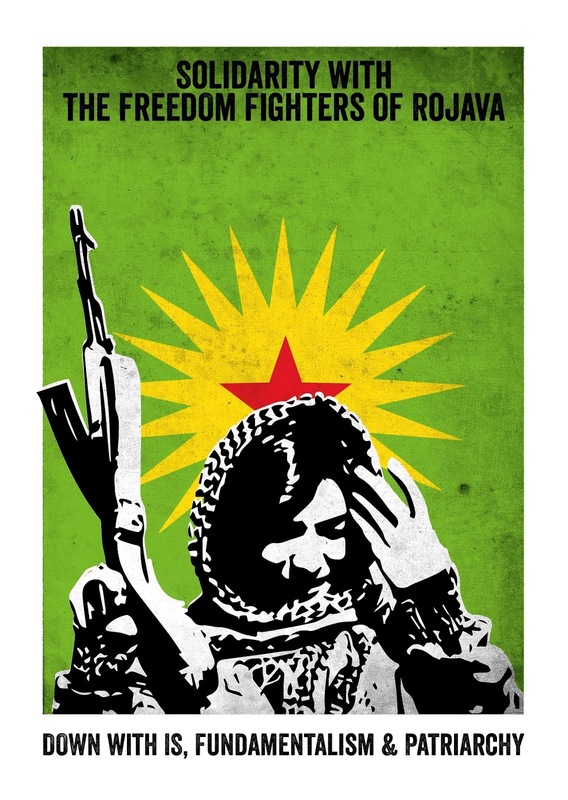 DAF are involved in solidarity with the Kurdish struggle, the Rojava revolution and against ISIS’ attack on Kobane, and have taken action against Turkish state repression and corporate abuse. They are attempting to establish alternatives to the current system through self-organisation, mutual aid and co-operatives. But in Ottoman times there had been many articles on anarchism in the newspapers. For example, one of the three editors of the Istirak newspaper was an anarchist. The paper published [Russian anarchist, Mikhail] Bakunin’s essays as well as articles on anarcho-syndicalism. DAF: Now we get 500 anarchists turning up for Mayday in Istanbul. We are in touch with anarchists in Antalya, Eski?ehir, Amed, Ankara and Izmir. Meydan [DAF’s newspaper] goes to between 15 and 20 cities. We have a newspaper bureau in Amed, distributing newspapers all over Kurdistan. Until now, it is in Turkish but maybe one day, if we can afford it, we will publish it in Kurdish. We send Meydan to prisons too. We have a comrade in ?zmir in prison and we send copies to over 15 prisoners. 26A Café is a self organization focusing on anti-capitalist economy. Cafes were opened in 2009 in Taksim and 2011 in Kadiköy [both in Istanbul]. The cafes are run by volunteers. They are aimed at creating an economic model in the place where oppressed people are living. It’s important to show people concrete examples of an anarchist economy, without bosses or capitalist aims. We talk to people about why we don’t sell the big capitalist brands like Coca Cola. Of course the products we sell have a relation to capitalism but things like Coke are symbols of capitalism. We want to progress away from not-consuming and move towards alternative economies and ways of producing. Another self organisation, PAY-DA – ‘Sharing and solidarity’ – has a building in Kadiköy, which is used for meetings and producing the Meydan newspaper. PAY-DA gives meals to people three times a day. It’s open to anarchists and comrades. The aim of PAY-DA is to become a cooperative, open to everybody. We try to create a bond which also involves the producers in the villages. We aim to have links with these producers and show them another economic model. We try to evolve these economic relations away from money relations. The producers are suffering from the capitalist economy. We are in the first steps of this cooperative and we are looking for producers to work with. DAF: Kemalism is still a force in schools but the AKP has changed this somewhat. The AKP has a new approach to nationalism focused on the Ottoman Empire. It emphasises Turkey’s ‘Ottoman roots’. But Erdogan still says that we are ‘one nation, one state, one flag and one religion.’. There is still talk about Mustafa Kemal but not as much as before. Now you cannot criticize Erdogan or Atatürk [the name used for Kemal by Turkish nationalists]. It’s the law not to criticize Atatürk and the unwritten rule not to criticize Erdogan. The media follows these rules. The AKP [the ruling Justice and Development Party] say they have opened Kurdish TV channels, allowed Kurdish language and that we are all brothers and sisters, but on the other hand we had the Roboski massacre which occurred during their government. In 2006 there was government pressure on Erdogan at a high level. Erdogan said that women and children would be punished who go against Turkish policies. Over 30 children were murdered by police and army. The YPG and YPJ [‘People’s Protection Units’ of Rojava, the YPJ is a women’s militia] pushed ISIS back day by day. Mistenur hill was very important for Kobane. After the hill was taken by the YPG and YPJ some people wanted to return to Kobane. When they went back their houses had been destroyed by ISIS. Some houses were mined and some people have been killed by the mines. The mines need to be cleared, but by who and how? People need new houses and help. We have had conferences and talked about how to help Kobane. There was a conference two weeks ago in Amed. This entry was posted in Commentary, News blog and tagged anarchism, Occupy Gezi/Taksim, turkey. Bookmark the permalink.